The brown and the beautiful: The golden eagle is a large bird of prey that belongs to the hawk and eagle family. With broad, rounded wings, the colors of the eagle's feathers range from black-brown to dark brown. But it's the striking golden head and neck that give the bird its common name. Eagles can see much better than a human with perfect vision can. Golden eagles have large eyes that take up most of the space of the eagle's head. Their keen eyes can see clearly and in color, allowing the eagle to spot movement from a long distance. Although golden eagles can see extremely well during the day, they can see no better at night than we can. Their eyes don't move much in the eye socket, but an eagle can rotate its head about 270 degrees, just like an owl can, to look around. Golden eagles also have a clear eyelid that protects their precious eyes from dust and dirt. The golden eagle's habitat includes the wide-open spaces of high mountain areas. Oh, give me a home: Golden eagles need the open space of mountains, plateaus, and steppes. Yet they are also found in prairie, scrubland, desert, and tundra habitats. They range from sea level to high mountains such as the Alps and the Himalayas. Golden eagles can fly hundreds of miles while foraging for their food. They often use mountain ridges to ride the thermal updrafts that sweep up from the valleys and deserts below. These help them gain elevation without expending much flying effort. Golden eagles living in the northern parts of North America and Asia migrate south in winter. Golden eagles are excellent hunters. They often work in pairs while hunting: one eagle drives the prey to its waiting partner. The talons on their feet kill and carry the prey, while the beak is only for eating. Prey includes marmots, hares, mice, and sometimes slow-flying birds, martens, foxes, and even deer. They may also eat carrion if live prey is scarce. After a successful hunt and meal, the golden eagle can go for several days before its next meal. At the San Diego Zoo Safari Park, the golden eagle eats a fortified meat-based commercial carnivore diet, thawed mice, rats, and an occasional rabbit or trout. Golden eagle chicks, called eaglets, hatch in the order laid. Life on the fly: Golden eagles are somewhat solitary birds, but they may bathe in small groups or roost together in cold weather. Immature birds often hang out with each other in winter, and fledgling pairs may preen each other. Golden eagles play with stones, drop and re-catch sticks, and chase horse colts and cattle calves. Youngsters often play dive with each other. Breeding pairs maintain territories of 2,800 to 4,900 acres (1,100 to 2,000 hectares) and may attack eagle intruders by diving at them or locking talons. Golden eagles are much more aggressive than bald eagles. Golden eagles are usually silent. But during mating and nesting season, they make a shrill, high-pitched note repeated over and over. 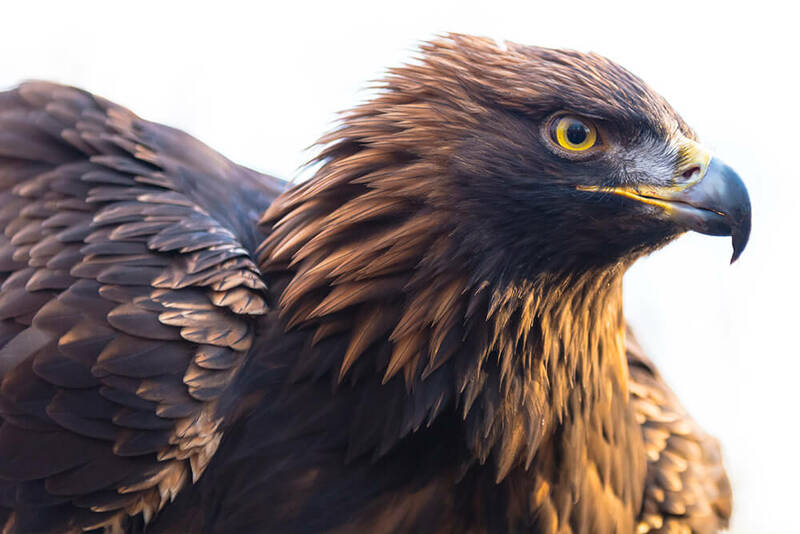 Other calls made by golden eagles include a chirp, cluck, honk, and hiss. Chicks make high-pitched begging calls to their parents. The male often puts on an aerial exhibit as part of his courtship. He folds his wings and drops headfirst until close to the ground, when he spreads his wings to soar aloft and repeat the action. A golden eagle pair stays together for life, building several nests in their territory over the years. Each nest is made out of heavy tree branches and grass, and built on a cliff face or in a tree. The eagles add more material to the nest each year, so it gets bigger and bigger. The female lays two eggs a few days apart between January and May, depending on the habitat. The chicks, called eaglets, hatch in the order laid. The oldest chick often attacks and sometimes even kills its younger sibling. The mother feeds the eaglets for about 50 days. Then, it's time for the eaglets to attempt their first flight and eat on their own. Usually only one, the older chick, graduates out of the nest. Eaglets look like the adults but have a duller, more mottled appearance. They have a white-banded tail and white patch on each wing that gradually disappears with every molt. Golden eagles don't reach their full adult plumage until they are five years old. Adult golden eagles have little to fear from natural predators, although crows, jays, and other raptors often harass them. Eagle chicks are not so lucky, as wolverines and grizzly bears may prey on them. Tonka the golden eagle can be seen at the San Diego Zoo Safari Park. Golden eagles have been a part of San Diego Zoo Global’s collection on and off since our early days in the 1920s. The San Diego Zoo Safari Park’s Frequent Flyers bird show rehabilitates injured wild golden eagles brought to us by the U.S. Fish and Wildlife Service. We offer these birds a safe place to recover their flying skills before release back into the wild. Currently, a golden eagle named Tonka soars down to the bird show audience at the Safari Park. A hiker in the Angeles National Forest found a young Tonka on the ground with an obvious injury that turned out to be a broken right hip. She imprinted on humans during her recovery at a wildlife rehabilitation center. Tonka spent some time with a falconer as well before coming to the Safari Park in 2004. Tonka requires a large enclosure, special food items, lots of enrichment, and exercise. We are happy to provide this care for Tonka. In turn, she gives guests an incredible, up-close experience. Although golden eagles are known to be shy, Tonka is a confident bird. She has been on national television and even made an appearance at a Padres game during National Zoo Keeper Week. She is not bothered by large groups or modern marvels that may make other wild animals a bit uncomfortable. The best way to see Tonka is to attend the Safari Park’s animal encounters, where she is a star on the Ambassador Stage. At times, we display her exercise routine (flights) near the Park’s Okavango Outpost. She is a beautiful ambassador for her species. In past years, ranchers killed thousands of golden eagles, thinking the birds preyed on young sheep and goats. Yet studies showed there was no evidence that the eagles attacked sheep or other livestock. Instead, it was found that rabbits were the eagles' main food source. In 1962, golden eagles became a federally protected species. Unfortunately, many golden eagles are still killed by ranchers or others for their feathers. And their propensity to seek out strong winds can bring the birds into proximity with wind farms. Dozens of eagles are killed each year when they land on exposed power lines or attempt to fly through wind farms. Others are caught in traps set for other animals or are poisoned by tainted bait or lead shot buried in their prey. But the main reason for their decline in numbers is loss of habitat. San Diego Zoo Global works with energy companies to track golden eagles in Southern California and Baja California, Mexico. Several golden eagles wear miniaturized GPS transmitters so their movement patterns can be monitored remotely. The data from the eagles helps us track their movement patterns and habitat use across seasons. This information can help plan the best locations for wind farms. We hope this predictive management tool can minimize the risk of harm to the birds and their habitats. You can help us bring eagle species back from the brink by supporting the San Diego Zoo Global Wildlife Conservancy. Together we can save and protect wildlife around the globe. Golden eagles can reach speeds of up to 120 miles (193 kilometers) per hour during a dive, in play or after prey. In central Asia, golden eagles are sometimes trained for falconry. Hunters in Kazakhstan still use these eagles to catch deer and antelope. The golden eagle is the national bird of Mexico, Albania, Germany, Austria, and Kazakhstan. Eagles have about 7,000 feathers.